Yesterday I realized we are only a week and a half from our annual family chicken stew. Until recently I thought everyone, at least everyone in the South, had chicken stews. After a recent news article, I discovered that chicken stews are very regional events. Without involving recipes (a point of contention at times), a chicken stew is held in the Fall. Chicken is usually cooked in a large cast iron pot (another point of contention at times) into a stew, obviously. It requires a large gathering of people bringing large quantities of food to accompany the chicken stew. Weather permitting, it is best held outside and involves a bonfire or fire in a fire pit. Alcohol is often involved, though we tend to skip that part here. So, I am now in panic mode to get all the cleaning, organizing and yard work done before next weekend. I am a firm believer that a party should be held at your home at least once a year. Not that I am big entertaining sort of person, but for the top to bottom cleaning that gets done. After this coming week my Fall cleaning will be done and I can go into Winter content until Spring. I will be exhausted, but content. This week I sat down and took on a drawing project that I have been wanting to do for a couple of years now. I have also been procrastinating for a couple of years because I didn’t think I could pull it off. I found a deer skull in the woods. Not an unusual event here. We find all kinds of animal skeletons laying around. 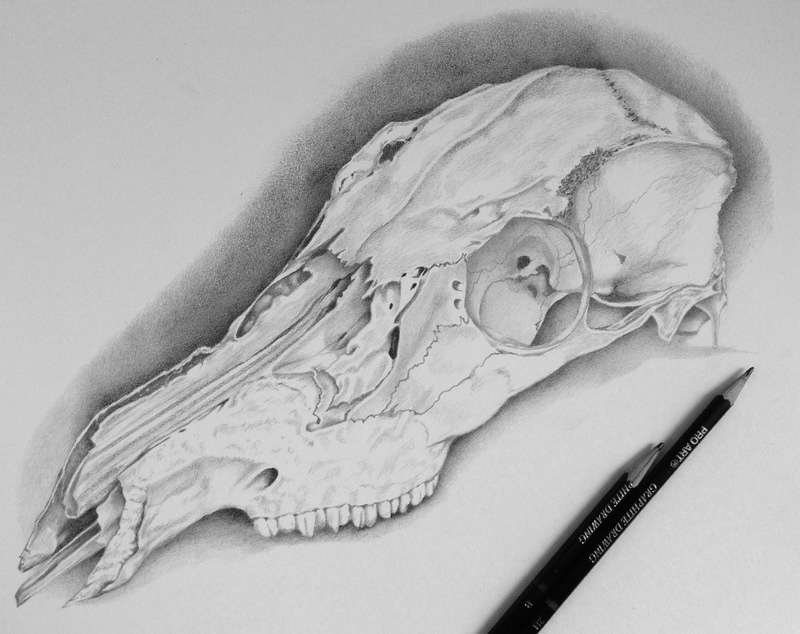 Maybe the skull is kind of creepy, but it had so many interesting nooks and cracks and shadows begging to be drawn. Finally I forced myself to focus and see if I could still draw the way I could way back in high school. Here is the finished piece. I have been doing a little happy dance. This may be my best drawing ever. It took constant self discipline to slow down and not rush the process. I have had to rush most of the work I have done in the past 25 years. Deadlines, deadlines, deadlines breathe down my neck constantly. You expect that with graphic design, but even with commissioned artwork most of the time there is a deadline. The client has come up with the idea, usually, almost TOO close to the time they need it. Birthdays, anniversaries, Christmas, etc. It was an absolute pleasure to know I could take as long as I needed to do this drawing. I did not want to put it away and come back to it though. That is how things find themselves in the permanent Unfinished Projects file. I have a draw full of those already. Estimated time for this was probably around ten hours over three days. While it made me very happy, that much focus has worn me out. There will be at least a week and a half break before I take on another big project. Ha, just in time to do that chicken stew cleaning! Have a wonderful week. If by chance, you don’t see a post from me next week, you will know that I am scrubbing, dusting, washing or organizing something. Absolutely stunning work! The realism is so good I had to look twice to consider if you had posted a photo or drawing. Really, really nice (and not the least bit creepy….at least to me). Thanks Deb! It was a ton of fun but some seriously focused work too.